The hero of our first Book of Common Prayer is Thomas C ranmer (Archbishop of Canterbury 1533-1555). However, and you knew there was a however, if you read a biography of Cranmer, it turns out he was more of a thoughtful editor of prayer rather than an original composer of prayers. Cranmer composed the Book of Common Prayer (1549) based on existing forms of Medieval worship and language, borrowing heavily of the texts used to worship at Salisbury Cathedral. I wrote this introduction to emphasize the point that the Anglican Church has been in prayerbook composition and revision from before 1549. Cranmer took existing texts and crafted them to fit the language and theology of his time. Likewise, prayerbook revisions continue to reflect the changes we have in our relationship with God. 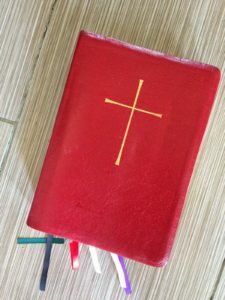 The Episcopal Church is currently revising the prayerbook that was finalized in 1979. The Book of Common Prayer 1979 (BCP 1979) greatly expanded the liturgical offerings of The Episcopal Church. The previous prayerbook lacked liturgies for Holy Week including Maundy Thursday, Good Friday, and The Great Vigil of Easter. Liturgies, such as Baptism, were greatly enriched by deeper and richer theology expressed regarding baptism. “We thank you, Almighty God, for the gift of water. This rich theological exposition of the gift of water was not in our prayers until the BCP 1979. The theology of our prayerbook is particularly important to Anglicans because it is through our prayers that we express our beliefs. Other faiths, such as Presbyterians, feel the need to craft confessions that outline the particularities of their faith. For Anglicans, we have our prayers, and those prayers express our faith. Note that this confession explicitly repents of sins committed on our behalf. One of the most poignant theologians of the 20th century, Reinhold Niebuhr, noted that human sins are inevitably more extreme when they are committed by social groups rather than by individuals (Moral Man and Immoral Society 1932). For example, racism is a sin committed by social groups. A racist individual has little power; a racist society practices deep injustice. It is vital for our relationship with God that we confess Sin which traps us because of our place in human society. To fail to confess this sin means we try to hide our sin from God. These examples are just two out of dozens of theological adaptations being tried, revised, expanded, and tried again in our current state of prayerbook revision. I invite you to delve into the richness of these efforts to make our prayer fit the type of language we need to use when we pour out our hearts before God.